I’ve been craving Japanese food again. We used to live there, and I love quite a bit of the food. Although here in The Woodlands there isn’t a good Asian store that carries a lot of Japanese items. Hopefully the next place we live will have a better selection. Anyway, we make Katsudon at least once a month, but I have never made Okonomiyaki. I loved getting it in Japan, especially when we visited Osaka (where they are known for it). SO I thought I’d try my hand at it. I’ll be trying homemade Yaki Soba next week! The Okonomiyaki is like a Japanese pancake of sorts. The batter is made with water (or milk) flour, salt and baking powder. Then you add a TON of cabbage, green onions, and any other veggies or meats you desire. 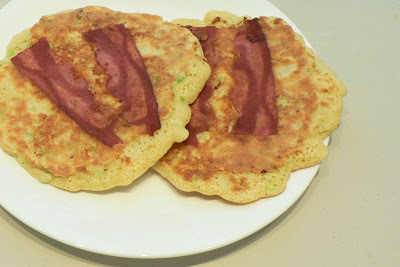 The pancake itself was great, but the American bacon didn’t work in it like the Japanese bacon did. In fact Japanese bacon has forever ruined all other bacon for me. I don’t know what the difference is, only that it is different and ours is nothing in comparison. So I’ll try it again, next time using baby shrimp, or maybe ham chunks!